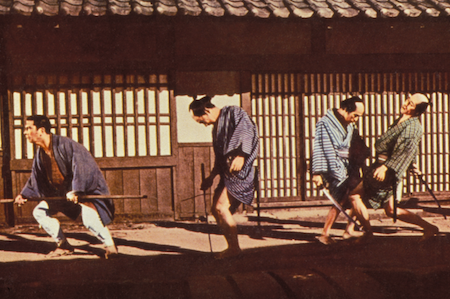 Zatoichi the Fugitive © 1966 Kadokawa Pictures, Inc. The fourth episode in the immensely popular 25-film action series features iconic blind swordsman Zatoichi (Shintaro Katsu) going up against a legion of local yakuza henchmen who target him after he defeats them in a wrestling tournament and then kills one of their own in self-defense. To complicate things, a former romantic interest reenters Zatoichi's life and a hot-tempered ronin, to whom she is married, seeks to end it for a reward. Composer Akira Ifukube, most famous for his work on the Godzilla film series, provides a characteristically spare and artful score.